Review: Oliver! Leicester Curve. Dickensian dynamite! – East Midlands Theatre. 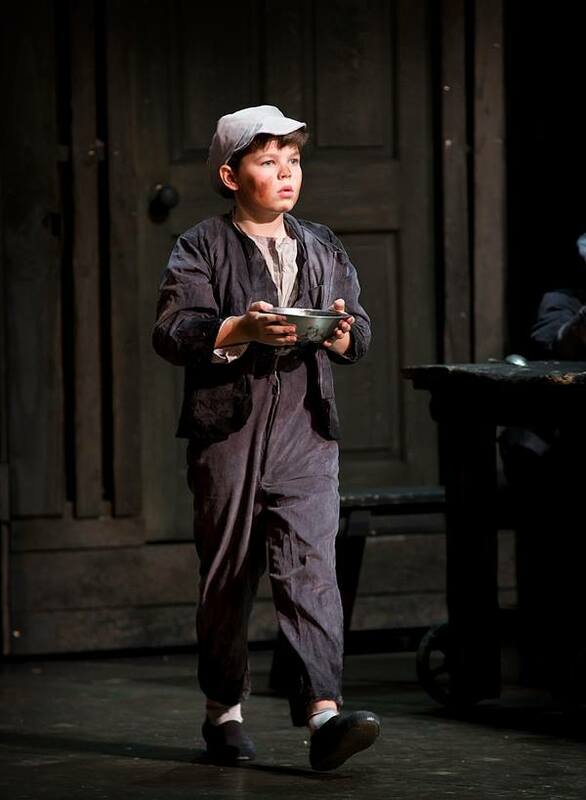 Review: Oliver! Leicester Curve. Dickensian dynamite! Directed by Paul Kerryson, this year’s totally astonishing production of Lionel Bart’s musical Oliver! at Curve Leicester is Dickensian dynamite! From the opening thunder claps and the stamping grey clad workhouse boys gutsy rendition of Food Glorious Food to the company finale Curve’s Oliver! is a complete out and out winner in pulling the musical heart strings whilst it celebrates the triumph of good over evil in a dark and brooding London cityscape. Graphic storm clouds may hover over Mat Kinley’s terrifically ingenious and metamorphic set but the heart of this production is in the vibrant colour that is injected into every one of the characters on stage and the energetically enthusiastic singing and dancing that courses through the pumping veins of its utterly engaging and often visually startling show. Peter Polycarpou’s Fagin is the perfect likeable rogue. Spoken and sung with a spot on lisping accent – he is portrayed as a subtly corrupt but protective figure that genuinely cares for the boys he has recruited as long as they do his bidding. Polycarpou’s musical theatre pedigree helps him to realise a first class performance that cannot fail to grace this exceptionally gratifying production as a whole. Tiny Albert Hart shows us Oliver Twist’s stronger willed side as well as his innocent wonderment in being accepted in Fagin’s den and witnessing the criminal pick pocketing scenes made comical. He wins over the audiences’ hearts particularly with his poignant singing of Where is Love? Kwame Kandekore gives us a fine Artful Dodger who is particularly good in I’ll Do Anything with Nancy (Cat Simmons) which allows him and the other boys to demonstrate a rather desperate need for a mother figure through a fun song. Oliver Boot delivers a menacing Bill Sykes and is very nearly upstaged by his unintentionally rhythmically barking dog ‘Bullseye’ in Sykes’ (played by Alfie) song My Name. On a more serious note Boot’s interpretation of the vicious Sykes persuades the audience of his evil by insidiously brooding action that slowly builds up into the terrible scene of Nancy’s murder. Simmons (Nancy until 2 Jan 2016) allows Nancy’s life roughened soul to shine beautifully in sincere renditions of the wistful As Long As He Needs Me and more robust It’s A Fine Life and is deliciously feisty in her depiction of the romantically doomed role. Dickens’ characters Mr Bumble and Widow Corney come splendidly and boisterously to life in this show through the often hilarious interpretations of James Gant and Jenna Boyd. This comic couple often remind us of Victor Hugo’s greedy innkeepers, the Thenadiers. Choreographer Andrew Wright certainly whips up an inventive dancing storm in all of the up tempo musical numbers given full orchestral weight by musical director Ben Atkinson. Multiple opportunities to be involved in the exciting Dance at Curve Leicester projects..
Review: Mike Kenny’s magical Cinderella at Derby Theatre.